John Boehner: "He looked hapless and humiliated," observes Susan Page at USA Today, particularly given his botched attempt to unite his caucus behind an alternative to the Senate bill. 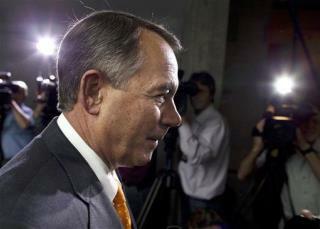 A new Pew Poll shows his unfavorable rating rising among all Republicans and soaring among Tea Partiers. The Republican party: It has taken the lion's share of the blame for this. "Six months ago, it was impossible to make a plausible case that the Democrats were going to take back the House," analyst Stu Rothenberg says. "Now, it's starting to look much more plausible." Ted Cruz: Several pundits put Cruz on their "winners" list, because he cemented his place as the Tea Party's 2016 candidate of choice. But his "name has become an epithet" for everyone else, and he's "earned the enduring ire of many other Republicans" for leading them into an unwinnable fight, Politico points out. "It's hard to imagine this doesn't come back to bite him," agrees Chris Cillizza in the Washington Post. Mitch McConnell: He, too, has earned some "winner" nods. ("Dude knows how to close a deal," writes an admiring Cillizza.) But Pema Levy at Newsweek points out that his compromise with Reid gives potent ammunition to his Tea Party primary challenger. "At a time when conservatives need him," a recent Matt Bevin campaign email read, "Mitch McConnell is negotiating surrender." Joe Biden: For a supposed 2016 contender, he was invisible during this crisis, even going on vacation at Camp David, the Hill points out. John McCain joked that he was in the witness protection program. The Tea Party: The new Pew Poll shows its unfavorable rating at an all-time high of 45%, but its most striking decline has been among moderate and liberal Republicans. Just 27% now hold a favorable view of it, down from 46% in June. On the bright side, "Their base is as riled up as it's ever been, and they're raising record amounts of money," one Clinton-era White House official observes. America's economy, system of government, and global prestige: Standard & Poor estimates that the shutdown has cost the US economy $24 billion. Congressional approval ratings plumbed new depths. The world looked on in horror. "Does anyone think this is how our government should work?" Cillizza asks. It has proven that "it is simply incapable of doing big things or, if we are being honest, even medium things." the interest on the national debt must be paid. $240 billion annually and growing, on the backs of our children and grandchildren!!! We need to take Ted Cruz to a mental Hospital for a mental exam along with the House recorder that had a melt down.